Yes, that’s right. Indianapolis is jumping on the bicycle bandwagon and I couldn’t be happier. The world-class Indianapolis Cultural Trail, an eight-mile bike/ped path that circles downtown and connects neighborhoods and cultural districts celebrated its grand opening in May. Bike share has been announced and will launch next spring. Mayor Greg Ballard has committed to building 200 miles of bike lanes by 2015 (a serious boost from the single mile of bike lane the city boasted a few years back). Another benefit? The city is nice and flat, which is good for easy bike trips around town. 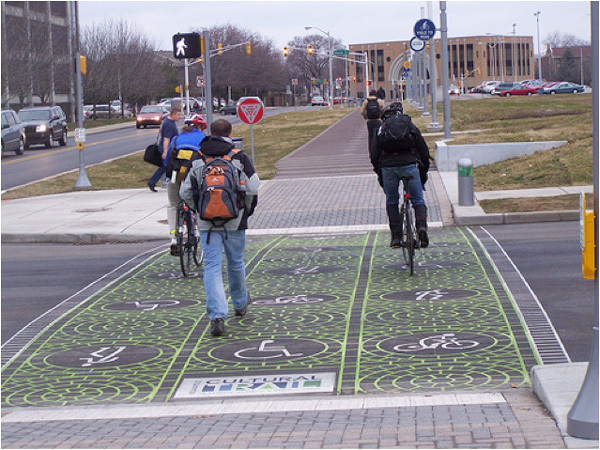 The Indianapolis Cultural Trail is a great example of a public-private partnership funding a major bike facility (image: Flickr user Green Jobs Now). First, the Cultural Trail is awesome. It ran right by the B&B where I stayed and I sat on the front porch and watched a steady stream of people bike, run, and walk by. Take a peek at this Streetfilms video for a virtual tour and background on how Indy financed the facility. Second, the Mayor is really committed. Nearly everyone I spoke to said Ballard wants bicycling in the city to be his legacy and he leads four community bike rides every year?including one the first week of January. Brrr. A good network of greenways extends out from the city core; now the work is in providing connectivity among and between neighborhoods. Last year we funded a series of bicycle summits in five underserved neighborhoods to help the residents identify where they are currently riding and where they need better infrastructure. Led by the Indianapolis office of LISC (Local Initiatives Support Corporation) and IndyCOG, the local bike advocacy group, the outcomes of these summits can help guide the city on prioritizing and building better streets for bicycling. Third, bike share?the essential ingredient for cities serious about cycling?is coming in 2014. Does the city still have work to do? You bet. The state legislature doesn’t seem to understand city transportation needs, street parking for cars remains sacred, and some major connectors are missing. But I have a lot of hope for a place that lets you ride your bike to the Indy 500?and park it for free.